Ultrasound Cavitation Lipo is widely recognized as one of the most effective cellulite reduction and local fat loss technologies available today. 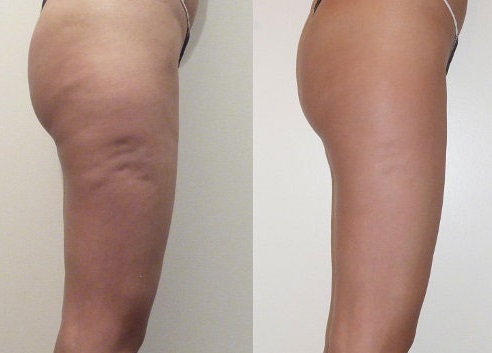 If you suffer from cellulite or you want a NON-SURGICAL solution for local fat deposit reduction, we believe it is the best single technologies you can possibly get today to fight your body imperfections. Ultrasound Cavitation Lipo uses special low frequencies to break down deep stubborn local fat tissues which are subsequently disposed of through the lymphatic and urinary systems. It is also effective in reducing cellulite. When applied in conjunction with Radio Frequency (RF) and Negative Pressure Massage it also helps to lift the sagging skin resulted of fat loss. Some reduction is typically seen immediately after but will continue to gradually improve in 8 to 12 weeks (which is the time needed for the body to naturally process the treated fat). Ultrasound Cavitation is not a replacement for a healthy lifestyle and exercise. It is a quick, easy way to help you slim and hit your personal shape goals. Coolsculpting causes treated area to bruise, which may last for a few weeks after Coolsculpting. Temporary numbness is common after Coolsculpting due to affect of freezing the tissues and nerves and may last up to 8 weeks. In some rare cases it may never be recovered back to normal as some people reported permanent loss of sensitivity at treated area. Cavitation has no known negative side effects. Delayed onset of pain and / or itching around 5 days after Coolsculpting. The discomfort is due to inflammation of the tissue. Freezing fat feels very uncomfortable to most people. ULTRASOUND CAVITATION DOES NOT HAVE ANY OF THESE LISTED ABOVE SIDE EFFECTS. 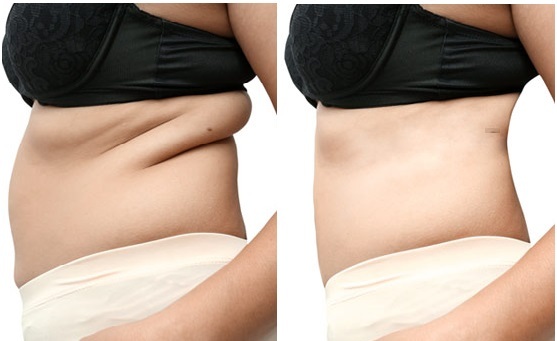 We believe that Ultrasound Cavitation also kwown as LIPOHIFU or LIPOSONIX overperforms SculpSure body contouring as well because you will see the results immediately after the treatment and they will continue to improve for 3-6 month after. With SculpSure you will see the results in about 3 month after the treatment. We work by appointment only - 6 days a week. Call 720-619-0877 or book online. Free consultation. FAQ: Can I lose weight with Ultrasound Cavitation? Ultrasonic Cavitation primarily designed to reshape and sculpt the body and remove localized stubborn fat or cellulite. Ultrasonic Cavitation treatments work best when combined with a low fat and low carbohydrate diet and regular exercise. It may help you to lose weight however weight loss is not guaranteed. How many treatments can I have? We recommend you have a course of 6 or a maximum of 12 treatments before having a break of 4 weeks to allow your body to recover. You should allow minimum 72 hours between treatments. How soon can I see a result of cavitation? Most clients will have a noticeable reduction in their measurements after the very first treatment, some have recorded 3 inches, however the average is a 1-1.5 inch loss. The process of fat removal continues for up to 7 days after each treatment so it isn’t unusual to see a further decrease a day or two after your initial treatment. Is the fat reduction permanent? Yes, the fat cells are fractured, broken down and the cells are drained away through the liver and passed as waste from the body. The service is tailored to the individual but generally including consultation and measurement, you can expect to be with us between 30 minutes to an hour if we are treating 2 areas in the same day. How long should I wait after childbirth to have cavitation treatments? You must wait a minimum of 3 months after normal birth of your baby or a minimum of 6 months after C section. It is best to get GP approval post childbirth prior to commencing Ultrasonic Cavitation. What would happen if I had cavitation during my period? Ultrasound increases blood flow and you would feel uncomfortable. Is cavitation safe if a woman has a fitted contraception coil? Yes this is not a contraindication. Can I have more than two areas treated in one day? Following the treatment, the body has to work to remove the excess fat that is now passing through the lymphatic system to the liver. For this reason, treating more than 2 areas is not advisable. We follow the rule of no more than 60 minutes of Ultrasonic Cavitation within 72 hours. What if I don’t see results straight away? It is important to remember that everyone is different and your body will work according to your unique metabolism. You will see reduction during a course of treatments which is why we recommend a course of 6 or better 12 treatments to get a great results. What can I do at home to help with treatments? Drink plenty of water and avoid alcohol after your service. Try and increase your heart rate by taking some exercise for the best results, even by doing some household chores, and avoid too many carbohydrates. Use our complementary vibration platform to increase blood and lymphatic circulation.